Elton Sint Jago is not your typical “Yu di Korsow”. He did more than just travel around Europe and the US like most islanders tend to do while studying abroad. He made a life altering decision to travel the world alone and dared go where very few islanders have gone before, taking pictures in his now signature Curacao t-shirts and thus spreading the word about this small Caribbean island. Having been bit severely by the travel bug myself I was super interested in his story. So when he told me he was visiting my now home island of St. Maarten I jumped at the opportunity to A. meet him and B. interview this magnificent and oh so very rare islander. Who is Elton Sint Jago? I am 33 years old, born and raised in Curaçao. I’m just a normal and regular island boy. I went to school in the Otrabanda area. Once I finished high school I left for the Netherlands to further my studies, and traveling has always been something I wanted to do. From a very early age I have been a very curious person, especially about other countries and cultures. What do they eat, what music do they listen to? My father gave me an Atlas to look through when I was 6 or 7 years old and that got my curiosity going. My family’s finances did not give me the opportunity to travel much when I was younger but once I left for the Netherlands I started taking part time jobs while studying, which allowed me to slowly start exploring, first Europe then Asia, etc. At what age did you feel the need to explore more of the world? 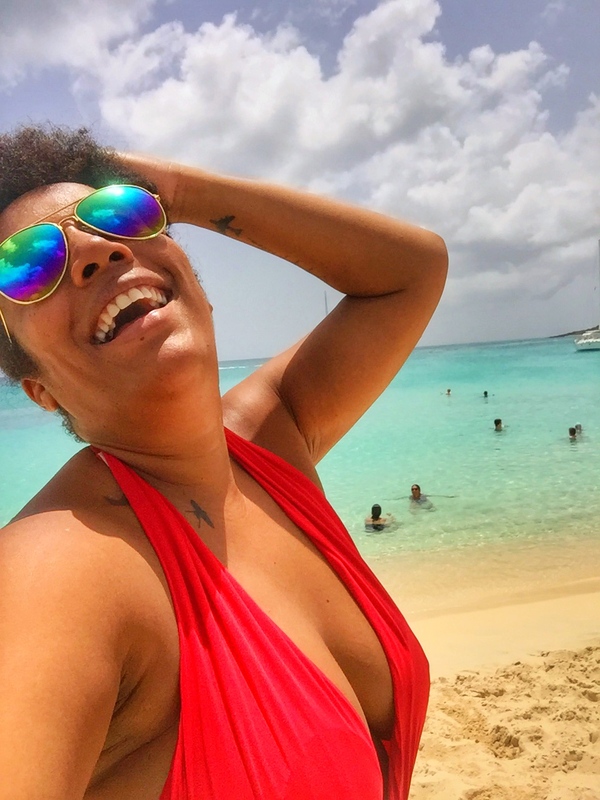 The first trip I did all by myself was when I was 19 years old, but after I started working s a teacher I suddenly found myself in a more financially stable situation that would allow me to save more and travel further. So I planned a trip to Paris, and then to Egypt and Prague. I think it was in 2004 when I was about 21 that I was bit hard by the travel bug. What was the first country you have ever visited? Before this trip to St. Maarten I was in Panama and Colombia. How did you come about doing a non-stop world trip for two and a half years? Did you plan it this way? Not really. I always thought it was probably going to take about two years but at the end it took a bit longer. I could have extended it even more but had to go home to Curaçao to be able to attend my brother’s wedding. Was the two and a half year of travel uninterrupted by home visits? Yes, although I stopped here and there to work to finance my travels to the next destinations. What would you advise someone who is right now thinking of taking such a world trip? There are a lot of things to think about. Insurance for example. You need travel insurance. But first you need to know yourself. Will you be able to be away from home for so long? I have a lot of friends, especially in Europe and I have visited most of them during my travels. What I mean to say, being a social person will make your solo trip a lot easier. You are going to meet new people all the time and like I said, I worked along the way so that made it easy to meet people and make new friends. I get asked often how I found jobs abroad and how I went about finding jobs. It has to do a lot with who you are as a person. We from Curaçao speak several languages, which is a big plus compared to many other people. This makes it fairly easy to find something seasonal to do in for example tourism and hospitality. Speaking of jobs; What was the best job you ever did abroad and what was the worst job ever? I worked as a receptionist at a camp site which was good but the best job was probably in Australia back in 2008 when I worked in a club as what the Australians called a “glassy”. Basically you walk around the club collecting empty glasses and whatever people would leave on the floor or on the tables, then wash them and restock. Obviously I was much younger then, I was 24 but what I liked so much about this job was that it never felt like work but more like you were part of the party. The worst job I ever did was also in Australia and I lasted only one day. I was a fruit picker. It was a very hot day and the job very boring. So you would go from country to country, work and save money to take you to the next destination? Yes, exactly. Wherever I had the chance to stay for a few months and work I would do so and because of our Dutch passport we can work wherever in Europe so that was quite easy. In Australia and New Zealand for example you can get work visas that will allow you to stay and work in the country for up to a year. What is the one country in all your travels that you cannot wait to visit again? The one country that inspired you the most? Let me begin by saying that there is no country that I would never want to visit again. It is very hard to choose only one because I truly enjoyed everything that each one of the countries I visited had to offer but during my two and a half years of non-stop travel one country stood out to me and that was Ethiopia. It is extremely rich in culture and history. It is Africa but still so different from the rest of Africa. The food, the language, the people, the history, it is all so amazing. I just can’t explain it. If you can, definitely visit this country. What country are you the least inclined to visit again? I think Ukraine although I would like to go back just to visit Chernobyl but other than that I would not easily go back to Ukraine. It is not that I did not enjoy it but if I really have to mention a country I didn’t like as much it would be this country. How do you adjust to life in one place after being a world wanderer for two and a half years? It’s not easy, especially in the beginning. I went back to a tiny island most people I encountered in my travels have never heard of, with no idea of where it is and can’t even begin to pronounce its name. But yes, especially the first two to three months were hard. Mainly because I did not yet have a car, which made me quite dependable on others. I hated it. But once I got my car it started getting a bit easier. The first half year was hard to get back into a routine. I try to keep myself busy. I play volleyball, I go running, I go to the beach, I spent time with friends, which to me is very important. But the travel bug is definitely still there. I can’t believe that St. Maarten is your 71st country to visit yet it is your first time here. Especially seeing our history as all being part of the Netherlands Antilles. This makes me wonder, what other Caribbean islands are still on your to-visit list? Everybody says the same. Everything has a first time, I guess. Like I said, before I moved to the Netherlands I did not travel much and once in the Netherlands I traveled mostly in Europe and Asia. Once back in Curaçao I visited places in Latin America. I’ve always said I want to leave the Caribbean for when I move back to Curaçao since it is so near. I really want to visit Dominica, Grenada, Haiti and Cuba obviously. So what destination is next on your list? I try to go away in every break I get from work. Next up is December but I have no idea where to go yet. I’m not even sure I will make it financially to go anywhere. I may visit friends in Panama or Suriname. What is the one destination high on your bucket list right now? Peru or Bolivia. Canada is on my list but not very high up. How is it to be back home? Is it difficult to communicate with old friends? How do you readjust? I did notice that in the two and a half years that I have been away that some of my friends have moved on and I don’t see them that often anymore. Others I still see a lot. I’m not mad at any of those friends I’m no longer in contact with. Such is life. Also, I feel like a lot of time the initiative has to come from me to hang out. Since we are almost in the holiday season; Where did you spent the best Christmas and New Year’s? I think best christmas was in the US. Once in Los Angeles and once in Michigan with lots of snow and lots of people. Best New Year’s was in Sydney, Australia. You do not get a lot of islanders that dare take such a trip of a lifetime. How have people accepted you back home? I have a monthly column in one of the newspapers so I do get recognized some times and people do contact me for travel advise now and then but my travels were done mainly for myself and I do not talk a lot about it so I do not get approached that often. What would you advise anyone out there wanting to do a similar long term trip but are afraid of taking the first step? If being afraid is your main reason for not doing it, it is completely normal. I mean, it is a big step and not something you do easily. I myself asked myself the question many times: What the hell am I doing? Am I crazy? But you have to go for it. Just do it and once you do it, you will not regret it. What about marriage and kids? I’m at that age right now where everyone is asking me about that. But I am not ready. I mean, I love children, I’m a teacher but I’m not done traveling. If I find someone it has to be someone who loves it too. I don’t think I want to do another two and a half year away, it’s not something I ever want to do again but a trip lasting a few months here and there would be nice. What is the last thing you would want to tell the TTIG readers? If you want to travel just go for it. Talk to persons who love to travel or who have done long term or solo travels before. Most friends and relatives will be negative when you speak to them about taking a long trip by yourself and that will keep you from doing it. Don’t even tell them about your plans until you’re booked and ready to go. You can reach out to me via my travel blog (see link below) or any other traveler you find online, If you are really eager to do it nothing will be able to stop you. Read more about Elton and see photos of his amazing journey on his travel blog www.mytb.org/Elton. Feel free to contact him for advise on destinations or anything travel. He has also started a Facebook page to inspire others, especially islanders to go travel the world and to step out of their comfort zone. Do you have some long term travel plans or a solo trip coming up? Comment below and let us know what your plans are or what destination you would like to know more about. Remember to always Laugh, Live and Travel. That’s for sharing, a very interesting and enjoyable read. Elton’s story is so interesting, isn’t it Gilda?